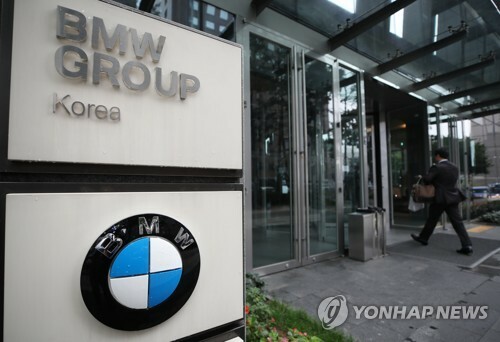 SEOUL, Oct. 12 (Yonhap) -- BMW Korea is reviewing a recall plan for the 118d sedan and other models not subject to the latest recall following engine fires in the 520d sedan, the transport ministry said Friday. BMW Korea is in the process of recalling over 106,000 BMW cars to fix the exhaust gas recirculation (EGR) component the carmaker blamed as the "root cause" of dozens of fires in BMW cars this year, mostly in the 520d sedan. South Korea's joint investigation team -- composed of 20 outside experts and 14 officials in charge of recall matters -- has found the 118d model also carries the same faulty EGR component, the Ministry of Land, Infrastructure and Transport said in a statement. "The government has asked BMW to clarify why it ruled out the 118d in the ongoing recall and to consider recalling the model as well," a ministry official said over the phone. The German carmaker plans to decide on the timeframe of recall for the 2.0-liter 118d sedan and other models equipped with the same EGR component, which might cause engine fires, he said. The EGR is one of the principal devices used to reduce nitrogen oxide emissions from diesel engines.